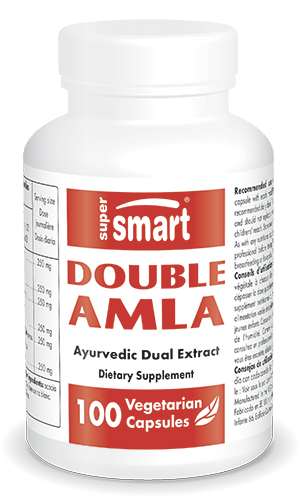 Double Amla Supplement | Multiple Health Benefits | Get Here! Amla (Emblica officinalis) is the fruit of the Indian gooseberry, used in traditional Ayurvedic medicine for thousands of years. Its beneficial effects are associated with its high tannin content. This new complex combines two distinct extracts: one standardised to 45% tannins and the other, the recently-discovered Saberry™, standardised in gallic acid and beta-glucogallin. This dual standardization increases the beneficial effects of amla beyond its antioxidant properties or the properties of polyphenols in improving circulatory problems. - for use in cosmetology as it provides oral nutricosmetic substances that combat collagen breakdown by producing a pro-collagen, or counters the harmful effects of UVA and UVB when used in topical creams or gels. Other ingredients: microcrystalline cellulose, magnesium stearate, silicon dioxide. Saberry™ - Sabinsa. Take one capsule with each meal.